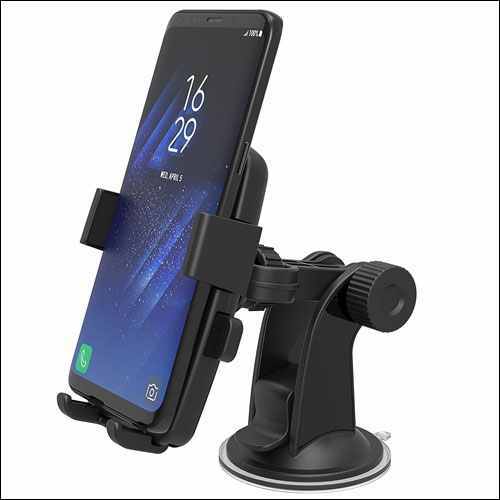 A cell phone holder for your Samsung Galaxy S8 and S8 Plus devices is the finest accessory if you want to communicate with your mobile phone when driving. so after testing and researching lots of car holders, we have picked up few best car mounts for Galaxy S8 and S8 Plus. Top-rated car mount holder will hold your phone securely and protect your smartphone from dropping down when driving on bumpy roads so always use the best phone holder to navigate your way on Google maps. Now let’s explore this list of universal car mount for Galaxy S8 and S8 Plus. Here, we have listed some of the best Samsung Galaxy S8 and S8 Plus Car Mounts for you. This car mount comes in the shape of a robust telescopic arm which can be extended from 14.5 inches to 18.5 inches. The unique design of this arm holds your phone in such a way that you can easily access the side buttons and ports of your phone. This car mount is the ideal one to use for navigation, texting, calling, or accessing other functionalities of your phone while driving. Moreover, the anti-vibration technology used in it offers a sturdy grip to your phone; freeing you from the worry of unwanted drops and accidental falls. The encased car mount is specially designed for Galaxy S8 and S8 Plus device but not for Bixby side button so you have to adjust slightly when mounting your phone. The car mount holder is easy to install on dashboard or windshield and rotates horizontally as well as vertically. The design of this cell phone mount is so much convenient that you will be easily able to put and remove your phone with just one hand. The mount is compatible with and without a case. This magnetic car mount from Maxboost for your Galaxy device is a perfect answer to a hands-free driving and it won’t shake even if you are driving your car on bumpy roads. You can install this car mount either on dashboard or windshield. With this holder, you also charger your device wireless by removing a metal plate from it. The universal mount comes with six strong magnets and metal plates to secure mounting of your phone. The adjustable arm provides the perfect viewing experience while driving a car. A strong suction cup holds your phone firmly and protects your device from any slips and drops. The iOttie Easy One Touch Car holder locks and releases your device within a single push of your finger. Just press the side buttons provided and set or remove the phone in the car mount. It has sticky gel pads that easily stick to any surfaces and also provides an easy removal without leaving any residues. The suction cup can also be reinstated to its original condition just by cleaning it with warm water and allowing it to dry in air. The 360-degree rotation capacity allows you to keep your phone either in a landscape or portrait view. Spigen brings to you car holder which work well with Spigen’s QNMP cases, but you can also use it with other cases as well. This car holder comes with 2 rectangular metal plates and 2 protection films to guard your phone against any damages. The powerful magnetic plate firmly holds your phone with great stability. It easily slips in any air vents. You can place your device either in portrait or landscape orientation and enjoy hassle-free access to your device. iPOW’s mobile phone holder is the second generation silicone base mount provides better stability and secures your Galaxy device from dropping down. The mount can be easily clean with water and you can also keep your sunglasses, cigarette, keys or any other things in it and prevent them from slipping while driving. The most exciting feature of this mount is that you can also use this holder as a table stand at your home or office and watch movies and tv shows. The small C type clips will help you to adjust the angle of your phone. The car mounts from TechMatte has been featured as the best car mounts for the years 2015 and 2016. It easily fixes in the CD holder slot of your car. Just insert the mount into the CD player slot, tighten it, mount your phone and you are good to go! The strong magnetic grip provided holds your phone; hence ensuring safety and stability to your device. You can adjust the phone is different viewing angles as per your convenience. Spigen delivers you the perfect car mount for your Samsung Galaxy phone. These compact-sized car holders like the shape of a small disc easily fit the air vent of your car. You can place this mount either vertically or horizontally – whichever way you want. With the best design and engineering, Spigen offers you to have a worry-free driving while the magnetic mount takes care of your phone. The 4 powerful magnets hold your phone firmly. Also, the design is such that it will preserve your phone and air vent from scratches. The air vent car mount is the best for your Samsung Galaxy S8 and S8 Plus. The thing that separates it from other air vent car mounts is its strong neodymium magnets. This universal car mount is the best to hold any of your smartphones of any size. Designed for the high quality of rubber material, this car mount perfectly fits in your air vent and guarantees a firm grip on your phone. Rotate your phone as per your wish without moving the mount. Also, its minimalistic design attracts the buyers to purchase it. Trianium offers you 6 powerful magnets with a rubber base and smooth surface has the property to hold your phone up to 10 times stronger as compared to other car mounts. It is made up of aluminum and its anti-slip property offers a perfect grip on your phone. This car mount is light in weight and small enough to be carried in your pocket. The 360 degrees rotational capacity allows you to set your phone in any viewing angles. The kickstand property offers you comfortable viewing of videos or movies. You get a warranty of 1 year on the purchase of this car mount from Trianium. We have already covered some of the topics like the best Samsung Galaxy S8 and S8 Plus Accessories and the best Samsung Galaxy S8 and S8 Plus Car Chargers in our previous articles which will help you to discover about vast accessories available in the market that can increase the proficiency of your phone. Which one of the above listed some of the best Samsung Galaxy S8 and S8 Plus Car Mounts will you prefer to have? Do write to us about your choices in the comments section.